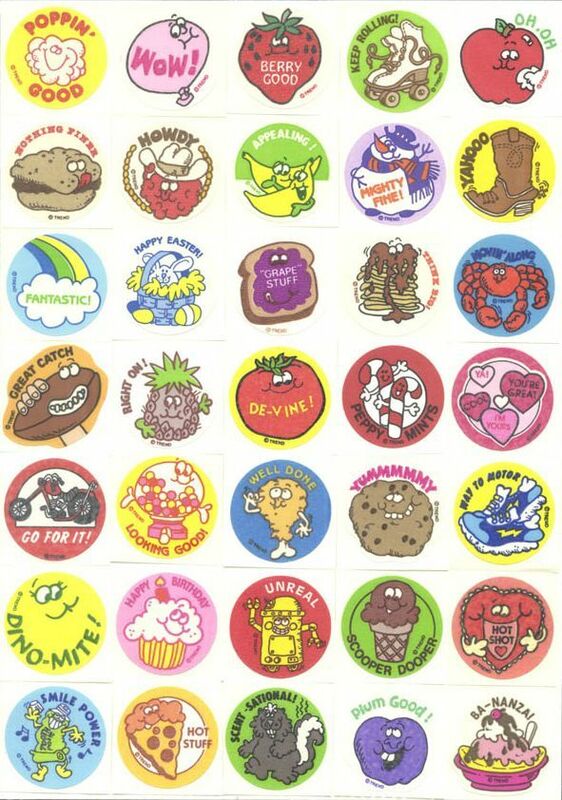 Who didn't love scratch-n-sniff stickers? They were huge in the 1970s-1980s, and my favorite brand was Trend. Trend had the round ones, generally on a white background, with cute lil cartoony items and maybe a couple of words of text. Shakespeare was not writing these things. The peach sticker said "Peachy!" The hot dog said "Hot Dog!" The smiling popcorn kernel, which had to be one of the most-printed stickers because it was EVERYWHERE, said "Poppin' Good!" Witty. Everyone had their own faves. I remember way preferring the sweet smells over the savory ones (pizza--blech!). I wasn't really a fan of the holiday ones--Christmas trees and turkeys and witches--but I always kind of liked the really odd ones, those things you wouldn't ever want to smell, like a shoe or an old tire. I guess some people really got into them and traded them, but we didn't--we scratched then and sniffed them and stuck them on things, but never took it to the trading or collecting level. Smell is the sense that can take you back in time like no other. So if you really want to spend just another five minutes in junior high or grade school or however old you were back in this era, find yourself your favorite sticker--the scents hold on--and give it a sniff. Here's one fan's discussion of how to buy vintage stickers. I remember really liking the chocolate ice cream cone one even though it didn't smell like chocolate. Which were your faves, and which scents grossed you out? Oh Gael, you are so right! The pizza sticker smelled like vomit, it was awful! I preferred the sweet-scented Trend stickers, too.. I still have all of my scratch n' sniffs from the 1980s in a sticker book, and, it's true, they do retain their scent. There was definitely some sort of incredible technology at work there! The one I really didn't like (but I still have), is a hot dog-shaped one that smells like... mustard... I think? That made me laugh. The pizza sticker didn't smell like Vomit you must have gotten a bad one LOL! TREND is still around and still making these stickers. You can find them at Teachers Workshop stores, and Trend still has a company site up. Only thing is.. they don't make them like they used to. Now they're all very boring photos with a general smell for all stickers no matter what the image is. It's like a Vanilla / Bubblegum flavor. There's no more uniqueness to any of them. Holy moly, I remember getting these in Kindergarten. We do something good, and get a sticker on the hand. My favorite was the skunk, because I would scratch it and shove it in other kids' faces. Good times.